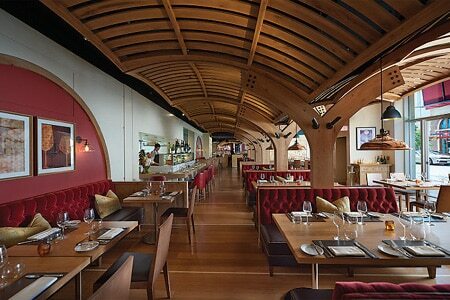 A branch of Daniel Boulud's bistro/wine bar in the Mandarin Oriental, Boston. Daniel Boulud was GAYOT's 2014 Best Restaurateur in the U.S.
: Daniel Boulud’s bistro/wine bar in the Mandarin Oriental, Boston, has curved wood ceilings designed to reflect wine barrels. Parisian pâté king Gilles Verot supplies charcuterie, seen on the small and large boards featuring pâtés, pickles, sliced meats and terrines. Starters include the lobster aïoli; French onion soup with oxtail broth and Guinness; a salade Lyonnaise with chicken livers and coddled egg; and rib-eye beef tartare elevated with confit egg yolk topped with caper cornichons. For a main course, we recommend the light lemon sole meunière served in a tasty brown butter with fresh capers, lemon and cauliflower. Coq au vin is made with a rich red wine sauce, pearl onions, bacon and juicy braised chicken. For more casual fare, order The Departed burger with cheddar, savory Guinness braised onions and crisp Irish bacon. The custard tarte Basque takes on brandied cherries and vanilla anglaise for a winning combination. The wine cellar features labels from all over the world, including selections from wineries near Boulud's hometown of Lyon, France. There are sister locations in New York and London.